I’m a regular speaker at many of the outstanding Rotary groups here in the Houston area. I love Rotary because the men and women who make up this organization are leaders. So I’m speaking today on the topic of leadership. As a business coach I work with executives and business owners to help them grow in their leadership. I help them find their role in the leadership of their business. But what is that role? It’s easy to simply say “leadership.” But what should a business owner be doing with his or her leadership? 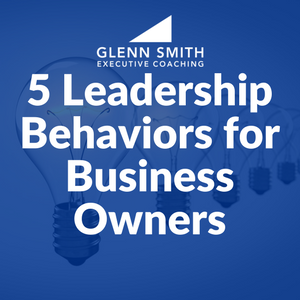 I want to give you 5 behaviors every business owner must do to be the leader their business needs. The best leaders are always looking down the road, thinking about where they are taking the team. They have to be clear and they have to talk about it. We call this “vision-casting.” A vision is very simply a picture of a preferred future. It is a place or a reality that everyone wants to be. The leader has to see that place, describe that place in emotional, heart-felt language, and keep the team pointed in that direction. Which leads to the second thing a leader has to do. It is so easy to lose focus. I struggle with it on a personal level every day. How much more do groups or teams struggle with it? A friend of mine said it this way: “Vision leaks.” In other words, we lose focus and forget where we’re going – and sometimes we even forget why! This happens more often than you think. Just about the time you get tired of casting the vision, just about the time you feel you’ve said it one too many times…that’s the moment your team will begin to catch it. The role of the leader is to keep the team focused! Now the reality is every leader is creating culture whether they know it or not. The question is are we intentional about the culture we’re creating and monitoring to make sure we’re actually creating the culture we want…positive or negative. Employees and team members typically leave organizations because of culture more than any other reason. We just never talk about it. What kind of culture do you want to create? The leader has to not only communicate a clear picture of where we’re going but they have to track and measure the results. Often we don’t want to do this because we’re afraid (or we know) we are not making real progress and we’re not getting the results we want. The best leaders are courageous enough to look their reality square in the face, admit it, and then make the necessary changes to get the results they want. In other words, they take responsibility. The most important task of a leader is to reflect. I tell groups this all the time and I frequently see puzzled looks on faces. But more than anything else, the leader has to THINK about where they are, what they’re doing, where they’re going, what they need to do differently, and how to engage and inspire the team to own the journey. The common excuse I hear is “I don’t have time to think, I’ve just got to act.” That leader is doomed to failure. The best leaders in history where not frantic, panicky individuals. They were men and women who lived very reflective lives. Like every leader, I would love your feedback or thoughts on these 5 behaviors. 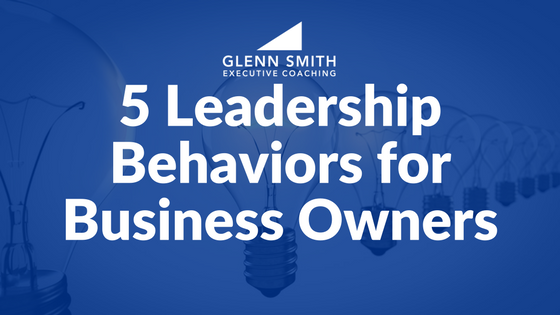 What other behaviors do you see as essential to being a leader in your business? Sound off in the comments. Most business owners know they should be leaders, but what does that look like? Here, I share 5 behaviors every business owner should do to lead their business. Your spot on. Don’t take time to reflect and measure you are doomed because that also means you are not planning effectively.